MPEG2 / MPEG4 ENCODER, and MUXER. 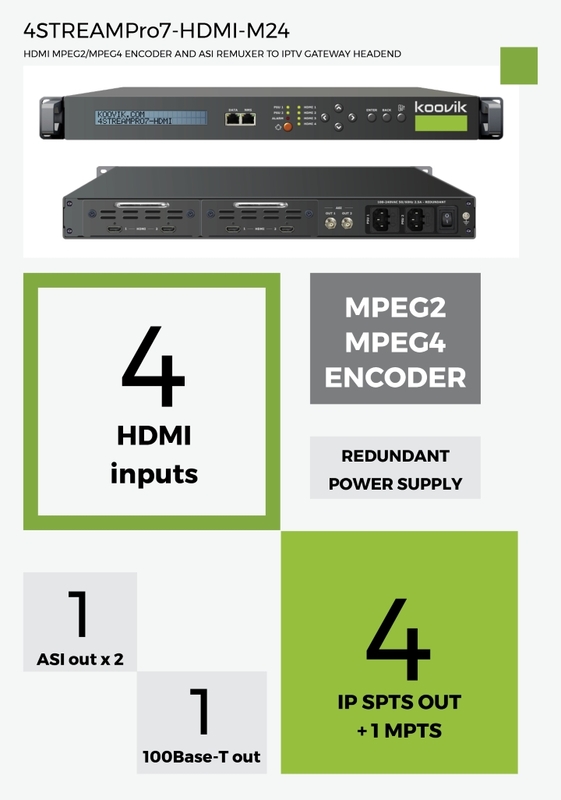 VIDEO CODEC MPEG2 / MPEG4 AVC H.264. High and Main profile. BIT-RATE 0.5 Mbps to 19.5 Mbps for H.264 encoder. CBR or VBR. User selectable per each video input. 1.0 Mbps to 19.5 Mbps for MPEG2 encoder. CBR or VBR. User selectable per each video input. IP MPTS 1 MPTS with 4 x HDMI TS over UDP or RTP/RTSP. Unicast or Multicast. ASI 1 x ASI ( 2 mirrored ASI outputs ). With 4 x HDMI TS. BNC 75 Ω female. included 2 x mains cable, 1 x ground cable, 4 x HDMI to HDMI cable, 2 x BNC male to BNC male.